Charge: $575. There are no additional charges.This includes 3 hours of shooting. Read more about photography method below - CLICK HERE . Is your wedding at 7:00 p.m. and lasting until midnight? Or a long afternoon into the evening? This package covers from 5 to 6 hours of photography - starting at approximately 6:00 p.m. and staying with your wedding until 11 p.m. or past midnight - for a huge collection of photographs of your entire wedding, reception and party. You can expect well over 350+ photographs and the price is the total price . At this price, this is a stunning bargain. With any package THERE IS NOT LIMIT to how many professional photos we will take. You are hiring our time, skill and equipment. Because of digital photography we will shoot any many and any professional photos you want within the time frame you have selected. So this means not only can you have great wedding photos but we will take family collections, poises with friends, special guests and relatives and any other combinations you want AT NO EXTRA CHARGE. This is another way we differ from most professional photographers. We are NOT going to try to sell you ANYTHING extra. The price we quote is the price you pay. There is no post-wedding sales pitch, no attempts to sell you overpriced prints, photo albums, enlargements etc. Merely by taking the CD_roms yourself to the photo processor for your professional photos you save hundreds or even thousands of dollars - PLUS YOU ARE IN CONTROL. Digital photography now allows loading photos on the Internet, photo manipulation (correction and changes) on home computer, and other advantages. PHOTO CHECK LIST - Pick your shots!! Click here. Call us and we will reserve your time and send you a confirmation letter and agreement. Digital photo processing? Same as film. You can take your CD to locations such as Wolf Camera locally. This is your approximate Total costs! 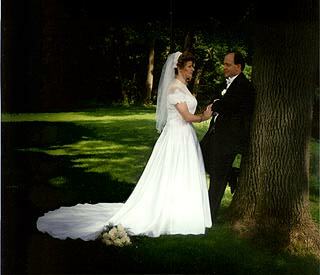 If you will take the CD-roms to the professional/art commercial photo processor yourself, you will save from 50-75% on your wedding photography costs. Plus, YOU have ALL the photographs, you can have twice as many in double prints for give-aways for a minimal charge, you may pick the photos you want enlarged - when you want them and without middleman costs - and you do not have to rely upon friends and relatives for your budget wedding photographs - plus you may pick one of the bonuses above for free. For many couples, this allows reasonable, professional wedding photography for a reasonable wedding budget. We still make a profit - but it is a fair profit. The Myth of Professional Wedding Photography? 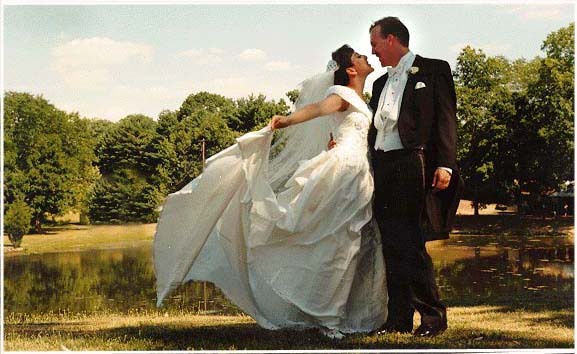 It is a myth that wedding photographers have a special film processing done to your photographs. They turn them in for processing the same as everyone. But you pay hundreds of dollars more then on mark-up, plus do not have the negatives, maybe wait for weeks for your photographs, and there are endless sale-pitches. We focus ONLY on photography with the identical professional equipment and film. You receive a more diverse and larger collection of portrait, wedding party, family and photo journalistic candid shots this way - while saving many hundreds of dollars. There is NO limit to the number of photographs taken while at your wedding, the prce is the total price (there is nothing else we try to sell to you, you have the negatives and may have your photographs the NEXT day after you turn them in. You may have enlargements made any time after - now or years from now. And we never take a copyright on your photographs. Call us - or just send and email - and we will reserve your time and send you a confirmation letter and agreement. There are many reasons why I prefer shoot-and-drop photography and it offers many advantages to couples. Shots can be made much quicker and afforably. They can then have this developed regular sized - and then have enlarged and duplicated only the ones that they like. Shoot and drop photography is very popular as it actually is affordable, allows couples to have their photos very quickly, eliminates middle-man processing costs, and the couple has all negatives. The advantage of a professional shooting the wedding is knowledge of what to shoot and what to watch for, to choreograph the wedding photography, plus insuring acceptable quality equipment. What makes for "professional" photography equipment? The key to quality in photography - particularly indoor photography is good quality, coated lens, fresh professional film and excellent flash unit(s). A professional lens will cost more than the camera itself. It is not simply a question of the glass (not plastic) being finely ground. It also needs to larger in diameter and "coated". Coated lens prevent color being bleached out. A high quality coated lens will cost about 3 times as much as the "same size" lens that comes on good cameras at most retail stores. The word "photography" actually comes from the Greek for "capturing light". All a camera does is use lens (magnifying glass) to focus light on a photo-reactive film. A larger diameter "magnifying glass", the more evenly it can focus the light on the film. "Coating" enhances "colors" and minimizes "white". For this reason, low grade cameras lack resolution and crispness. Where most home photographers scrimp on equipment is with the flash unit. But for indoor photography (even if well lit), the flash is the most critical component. What defines a picture more than any other element is correct shadows. Look around you and notice how much what you see actually is shadows. This "black" is so critical to realism, that for Hollywood movies, usually every third frame actually is black. Color video and photography have a very difficult time capturing shadows correctly. This is the reason old black and white tended to show more detail, depth and intensity. The flash will define the shadowing and dimension of the shot. For true professional photography, the indoor lighting itself becomes irrelevant. You could turn off the lights and it would not change the photo as the flash develops the light for the photo. With cheap cameras, the backgrounds turn dark or even black - as the flash usually is good for only about 10 feet - or less. A professional photographer will use whatever flash(s) are necessary to reach the backwall - without bleaching out the photograph. The angle of the flash also is VERY important. In normal circumstances, indoors our out, lighting comes from above - not from the side. Most people will notice that they look very different in the mirror than in a photograph. The reason is because in most photographs the light is "flashing" directly into their face, not from above and around. This produces unreal shallows and it is shallows that define shape and dimension - you look different because all the shadows are changed to unreal dimensions - changing how your features appear. Light should come from above your eyes and from around you, not straight at you. To compensate for this, a top-end flash unit will always be above the lens and will be tilted upward - to bounce some of the light off the ceiling (called "bounce back"). Collectively, this will add notable realism to your photographs and allow for high quality enlargements. What is the real quality of "one-time-use" (disposable) cameras? Have you seen some of the really neat looking, tiny 35 mm cameras (many quite expensive)? They produce just as good a quality as the big full framed cameras, no? You can not get a quality photo out of a lens that is the size of a pin head. The lens size is not the exterior glass, but the lens behind it. Because they are so small, they must use radical curves to have the light reach all of the film - so the light is spread very unevenly. Slight lens defects cause serious distortion. Because less light comes through, the shutter must stay open MUCH longer - producing blurring. For photography, you want a camera in which the view finder is actually looking through the lens - so you really know what you what the photo will look like. If the view is blurred, the photo will be blurred. It is impossible to obtain a high quality photograph out of a low quality camera - it just can not be done. It takes a lot of flash for indoor shooting. The flash should be very strong - and far away from the lens. "Red Eye" reduction systems do help eliminate red-eye with a flash close to the lens, but distort people's facial expressions. If red-eye reduction helped make good photographs, professionals would use them - but they do not. Instead, they get the flash away from the lens. This also prevents "flash dazzling" of the subjects. Red eye reduction does not eliminate that the people are looking straight into the flash. One nice feature that we have added is providing very small, completely independent "slave" flash units that we can place - that not only supplement our professional shooting of portrait and family shots - but will provide correct supplemental and fill flash for EVERYONE'S camera - so everyone's photographs will come out better - plus better choreographed. This was the best marketing concept I have seen in photography - to sell dozens of the crummiest cameras ever made for wedding photography. If you consider the actual production costs of a one-time-use camera, the resulting quality is obvious. The camera costs $8-12 retail. That means the manufacturing end sold it for about $3-4. Of this, is the cost of the film inside, the outside labeling, the plastic case, and the retail packaging, marketing, shipping, crating and their profit. This leaves about 50 cents for the actual production of the camera itself. The manufacturer can produce about 400 of these cameras for the same price as just producing one lens prism in a good camera lens - making 10 times as much doing so. The idea of handing out cameras is that guests will take photographs and then leave the cameras behind. They would write their name on the camera and the couple would have duplicates made - keeping one set and sending the other. HOW TO USE CHEAP CAMERAS? If you use one-time-use (disposable) cameras and cheap point-and-shoot cameras, remember these rules - particularly if shooting indoors. 1. Get in close. The flashes have a range at best of 10 feet. Keep the background close. If you do not, the background blurs away and turns black. 2. Have people NOT look at the camera - but a few inches away - such as telling them to look at your ring. The flash is so close to the lens that it will produce red eye. Remember, you do not have to have shoes in every photo and a cheap camera will not capture a big scene due to lack of resolution and lack of sufficient flash light. But no matter what you do, one-time-use (disposable) and cheap cameras will produce extremely low quality photographs. A couple should pick someone (friend or relative) to take photographs for them during the wedding, before and definitely afterwards. This will produce an entirely different "feel" of the photographs. You will like the portrait and group shots of the professional better, but will probably like the sense of the home-done photos for action and activity shots as they are more natural. It will give you more variety and it will save you quite a bit of money. But do not use a really low grade camera for this or you really will not like the pictures and will not want them in your wedding album. OTHER TIPS ON FULL SERVICE WEDDING PHOTOGRAPHERS? Most do very good work actually, and their time and cost factors are much higher than you think. No one gets rich in wedding photography, while it may seem that way to you. If your budget allows $1,500 or more for a full service professional, you will probably be pleased with the result. However, you will probably spend at least that much by the time you are done, regardless of the initial quoted price. OTHER RULES FOR PHOTOGRAPHY OF PEOPLE? Don't wait. Take the picture. People lose their freshness and smiles if the photographer has the people hold a poise as they wait, wait, wait for the picture. It can become quite annoying to the subjects if the person will not just take the picture. Many professional photographers ask other NOT to take pictures until they are done for this reason. People can only stay "fresh" so long in poises and tire quickly of photographs. If you ever watch a professional, they shot their shoots very quickly. It is people with the $10 one-time-use cameras who keep aiming the camera and telling people to straighten a tie etc. to find the perfect shot - when such a camera picks up no detail anyway. What is most tiring is when others are telling them "hold it, ok, now smile, get ready, here it comes, one - two - three - say money..." - rather than just taking the picture. Take more pictures faster. Rather than spending 30 seconds taking one picture - hoping the perfect looks will just appear in the viewfinder - take 3 photos quickly. Film development now is very inexpensive and with 3 fast shots you are 10 times as like to have a good photo than if one slow picture was taken. I do not know why so many people believe that they have to get everyone's shoes in every photograph. They step way back (worse thing to do with an inexpensive camera) and crunch everyone together, to make sure that they get everyone's shoes in the picture. Why? Have many shoes do you see on the cover of magazines? Did you know that for decades all portrait cameras shoot photographs vertically rather than horizonally? This is because people are tall and narrow. The reason almost all cameras now have the photograph image wider than taller - is because most cameras were for landscape shots and manufactures can make the camera a bit smaller this way. For shots of a single person or a couple, usually the camera should be turned sideways (with the flash always up). People are taller than they are wide, so match the scene and turn the camera sideways. Otherwise, the picture is consumed with a tiny person in the middle of a big scene. The great classic painters never centered a subject. Often, a better photograph results if an object or scene is offset against the person (or couple) on the other side. People do not always have to be dead center of the photograph. For example, a bride holding a bouquet could place the bride on one side, the bouquet near the middle and the alter, lake, etc. filling the other 50% of the photograph. Add variety and dimension to your photographs. Usually, if the shot is of just one person, they should not be standing square towards the camera, but rather should turn a bit to one side or another. This gives more dimension to the person. Also people do not always have to be looking at the camera. Men seem inclined to stand squarely facing the camera - when they should turn their body a bit to one side or another. Whenever possible, walk-in rather than zoom in. Most cameras have VERY weak flash units and the more you zoom in, the lower the quality of the shot. Most professionals in medium format do not even own a zoom lens. 35mm photographers will tend to have a limited zoom to allow very fast shoots to be taken - but for any poise will walk into the photo rather than zoom in. Some people will step back far - and then zoom in - stepping farther back to make sure the have all the shoes and a lot of background. This ruins the picture quality. Walk into a picture, rather than zoom in. This is critical with inexpensive cameras. The zoom seems neat, but it ruins the quality of the photograph. A good electric zoom lens costs start minimally at $300 (just for the lens) - so imagine the quality of the zoom lens on a $75 camera? HOW MANY GOOD PHOTOGRAPHS TO EXPECT? It is possible on a cheap camera to not have one decent photograph. For professional photography, if 50% of the photographs are acceptable without being corrected, it was a very good shoot. People blink, squint, look away... Sometimes attempts at fast, stylistic shooting will produce bad light effects etc. Most frustrating is if it would have been a wonderful photograph - had the camera not ruined it - again a reason again very low quality cameras and a reason to takes lots of photographs. I remember a wedding photographer explaining that if there were only 40 people at a wedding, they could be put into over 1,000 different combinations for shots. Do not just line up groups of people for your photographs. Take unannounced shots, actions shots, and watch for interesting shots. Do not always say "look this way!' before a taking a picture. You will get the prettiest smiles, most natural faces, and a much greater variety if you just take photos, rather than lining up groups of people. The main reason professional photographers do NOT show you all photographs and do NOT want you to have all negatives, is because at least 15-20% of the photos will be awful and another 15-20% only marginally acceptable. It can be human nature to complain. So if a professional gives a couple 250 photos - of which 160 are wonderful, 50 are ok and 40 are rotten, some people will pick the worse one and demand a partial refund. However, if the photographer only showed 125 of the very best - then the photographer seems a genious - though in fact the couple is out 75 very good or acceptable photographs. This also is a reason for a photographer to take many fast shots, rather than one slow shot. Many people will smile just after the flash goes off (maybe happy it's over?) A second fast shot will catch that smile - a big plus of fast pro-35mm photography over medium format and still another reason why I like fast auto winds and powerful flashes in 35mm - to be able to shoot multiple shots very fast. A great shot only lasts a split second. The greatest service a professional photographer offers actually is in spotting shots to take - and will usually take 3 to 5 times as many photographs at a wedding as others do - to tell a story rather than just take photos of people poising for a camera. Tell the photographer if you see a shot that you want, but also let the photographer do his/her work. Do have the photographer take live-shots during the wedding. Be hesitant to have a commitment to an exact number of pre-set shots. It is impossible to get good photographs by taking a single shot of each poise you wish captured and you want the photographer to take opportunity shots. You should ask the professional about what limits are set on the total number of photos taken. A wedding is a wedding, not a photo-shoot. Do not let the photographer take over your wedding (some will do that). 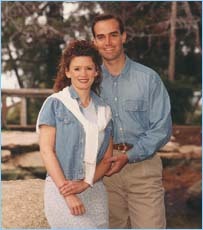 A professional photographer should mostly be in the background - except when doing the portrait shots and family shots. Do not be offended if the professional asks others NOT to take photographs during portrait and family shots. The photographer wants people to look fresh - and they will not if they have already poised for 17 pictures. People do not know what camera to look at. They become flash dazzled. With the advent of the super cheap one-time-use and under $50 cameras, wedding photographers have had to downgrade their equipment. The flashes on their cameras would wreck havoc on the professional's flash system. Superior lighting involved usage of "slave" flashes and strobes - that fired automatically by detecting the main flash on their camera (this produced superior lighting and shadows). As they do are not connected to the camera, they can be places at ideal locations for shadow effects and background lighting. Whether or not I will use a slave-flash system will depend upon how many cheap cameras I see in the room. If there are many, I know using the enhanced flash system is simply not possible and will shoot with a combination of dedicated professional flash units (fire only with my camera and therefore attached). This is how 95% of all wedding photographers now take their pictures. Do not be offended if a professional photographer asks people to wait to take their photographs. Rarely, a person will not remember if their camera film was used up or not - and the camera is dead. If you simply MUST figure it out, you can open the camera if you are in a PERFECTLY dark room. It must be 100% dark, not just really dark. Open the camera quickly and if you feel the film you know it was not rewound. If important photos, resist checking and take the camera unopened to a photo shop (such as Wolf) and have them open it. Flash units eat up batteries quickly. Have a lot of batteries. Turn off the camera when not in use as it keeps the flash charged - draining batteries quickly. Bring extra memory chips for your camera so you can shoot at the highest resolution. . If you hire a professional photographer, you want to receive the negatives for many reasons. 1st: You do not want YOUR wedding photographs to be "copyrighted". No processor will touch your photos for duplication if your photographer puts his/her name on them. Photos can be duplicated, but not if copyrighted. 2nd: You have no option but to buy replacement and enlargements from the photographer - at whatever price charged. 3rd: Who knows where your photographer will be in 5 years? Most photographers do NOT stay in the wedding field. 4th: You can have low cost duplicates made to give away of your favorite photos. Drug stores now charge about 25-35 cents per copy. However, you must have the negatives to do this with. They can not copy a photograph, only a negative. Click here to go to section on Medium Photograph Supplemental Options. You may have heard of "Medium Format" photography. This section you go to by clicking on the link above explains what medium format photography is, why you may or may not want it, and costs to add this to your wedding package. Digital photography is superior to any film camera for numerous reasons beyond just cost savings. You process only the photos you want, so you can take many of the same shots to get the prettiest (and open) eyes, smiles and poises. Digital photographs are easily corrected (like red eyes), lightness of photos adjusted and almost an infinite number of edits you can do. You also can make copies of your photos for about $1 a CD-rom on your own computer - meaning you can give them away and more importantly put other copies elsewhere for safe keeping. You can print the photos off with your own printer, email them, put them on websites. Don't let old photographers try to talk you into film or claim some superiority of "medium format" cameras. It is an inferior old method no true professional still uses for weddings. Store ALL your photo negatives (not just wedding) with a relative. If your photos are somehow lost - fire, theft, or other calamity, you can have all your pictures replaced in a day by the negatives. Or, put the negatives in a fire proof and hidden small safe. In photography, negatives are far more important than pictures. Can photographs be duplicated from other photographs? Yes, but it is very expensive and much of the quality is lost. Some shops, such as Wolf Camera, have self-service equipment for this, but it is costly and much of the quality is lost. In fact, to make a GOOD duplicate of a picture, a photograph is taken of the photograph to produce another negative. Everyone is aware that there is a dramatic difference in the quality of photography depending upon the camera equipment used. You can load pro film into a cheap camera - and it will still be a cheap, poor photograph. Equipment DOES make a difference. The same is true for digital photography. Just as film can not produce a high quality photography from a cheap, consumer camera, the "mgs of resolution" of a digital camera equally will not produce a high quality photograph. Just as all 35mm cameras can cost between $10 and $3,000 for the set up - both using the same film (and therefore same "resolution" in image storage ability) - the same is true of digital cameras. Unfortunately, some believe that the "mgs of resolution" of a digital camera defines quality. In digital photography, the only difference is that a digital chip records the image coming thru the lens, rather than recording it on film. Sadly, some couples will buy a 3 or 4 mg digital camera for a few hundred dollars - and then believe they have a high resolution camera. But it would be no different than loading pro film into a $50 point-and-shoot camera and belive it will produce high quality photographs. It is not possible to produce a high resolution photograph thru a camera that has a $5 lens glass with an opening the size of a pea. You can have incredible wedding photographs if you have images - regardless of the source. If you have seen those GREAT enlarged photographs that look like a painting on canvas, eyes sparkling and perfect smiles - this was NOT the work of great photography. Rather, it was the result of a very high quality digital images - and then the eyes fixed, smiles corrected, shadows removed etc. - digitally by the processor - who then created the portrait painting effect. You can have this done yourself and save a lot. So if your favorite photo seems ruined because it has eyes closed, red eye, an odd shadow etc. - you can have all that corrected at a fraction the costs. As long as you have good quality negatives, you can have fabulous photos and enlargements now - or whenever you can afford it. Have your wedding photos processed by a reliable source. DO NOT use drug stores or mail-in companies. They tend to use cheap, auto developers that are poorly maintained, the chemicals are not replaced often enough, and are not monitored. IF your goal is for quality snapshots, use WOLF camera. There are many across the metroplex. Their prices are very reasonable and they personally monitor the development process. However, if you wish, you can later have copies made from the negatives at discount stores (which does not alter the negatives). The key is to have superior initial processing of your negatives. IF your goal is fine portraits and enlargements, use BWC in Dallas. They charge a little more, but this is strictly pro/art quality in which a photographer might have a week's preparation for a single shot. They can produce ANY special effects and enlargements you want - even turn photographs into posters (high quality) and painting-like portraits actually on canvas. You can not make a race horse out of a plow mule. A cheap camera can not produce a quality photograph... Remember, it IS NOT the megabytes that count, but the quality of the lens and receiving chip. The tiny digital cameras have lens with an opening the size of a pinhead and an image chip not much larger. While they claim to have 6, 8, 10 or more megabyte capacity, that is very misleading in terms of quality. If your photos have a photographer's name on it, no processor will duplicate it... Our prices are the total - we NEVER try to sell you anything else and you get all photographs and all negatives immediately. Remember, a wedding is not a photography shoot or a military drill. Enjoy the wonder and excitement of the occasion. Good luck with your wedding plans!